The waterpark will not be open for Spring Break. Opening Day is May 18th for weekend operation. 7-days a week operation begins following Memorial Weekend. Are there any umbrellas or cabanas available? We offer private Cabanas and several areas for rent. Please visit our Cabanas and Tables page. We also have covered tables available on first come first serve basis. Are there any hotel/motel accommodations near by? 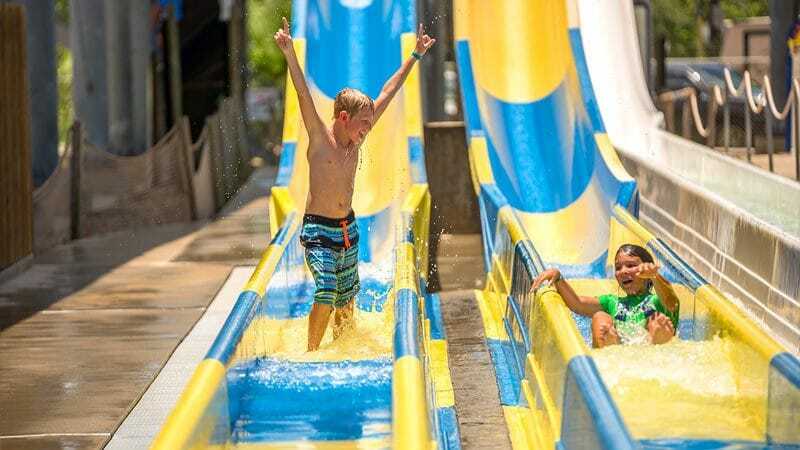 Splashway is a water park and family aquatic center located in the rural community of Sheridan, TX, which is located near the cities of Houston, San Antonio, and Austin. The nearest hotel accommodations are located 20 minutes away in both Hallettsville and Columbus. 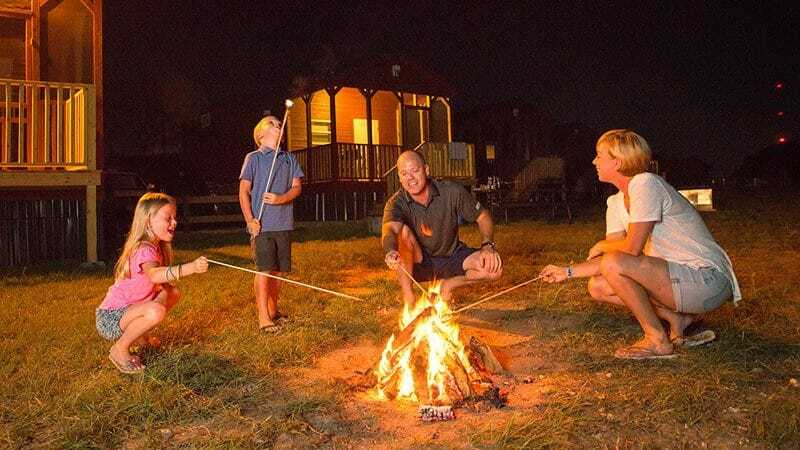 We do, however, have an RV Park and Campgrounds that welcomes any guests wishing to tent camp, bring their RV, or rent one of our cabins or cottages. Do you allow ice chests/coolers? 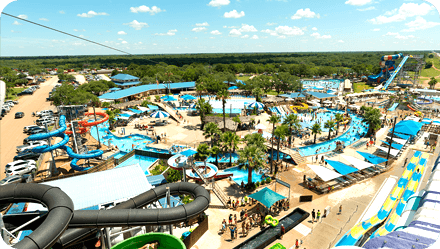 Splashway does allow coolers at our Houston area family aquatic center and water park, however, no glass containers, knives, or alcoholic beverages are allowed. Also, Splashway has its Café serving everything you can imagine including Hamburgers, Dr. Pepper, Funnel Cakes, and Dippin’ Dots Ice-Cream. See more info on our food options. How much is parking at the water park? Parking, inner-tubes, and life-vests are all FREE! Are there lockers located at the water park, if so how much do they cost? Lockers are available for a fee at our Houston area family aquatic center plus a $10 deposit. The deposit is refunded (with your receipt) when the key is returned. We have assorted sizes ranging in price depending on the size you need. Do you allow pets inside the Waterpark? We do not allow pets inside the water park unless pets are required for handicap assistance. However, no pets are allowed in the water. 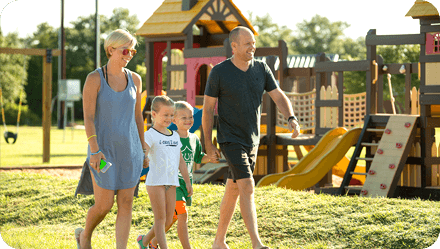 If we are staying in the campgrounds is admission to the Waterpark included? The camp pricing is separate than that of the waterpark. Payments can be made upon arrival or the following day at the park admission booth. 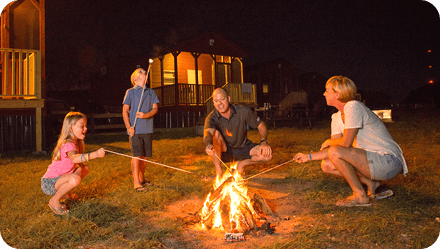 How far in advance do I need to make Camping, Cabana, Birthday or Group reservations? It is recommended that reservations be made as soon as possible. The weekends tend to fill fast as a limited number of reservations are taken daily. All reservations are done on a first come basis. All reservations require a deposit/payment with credit card. Private Cabana reservations are available daily! Yes, please refer to our General Rules Guide for more information. Does Splashway offer bad weather passes in the case of inclement weather? As you know, Texas weather during the summer can be pretty unpredictable. We do our best to keep the water park open. We want the sunshine just as much as you do. Unfortunately, there are days in which inclement weather can cause us to close the water park. We monitor each weather situation very close and make a decision to continue to wait it out and continue operation or close for the day. 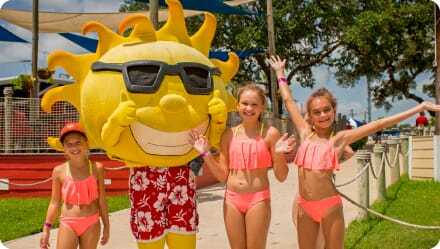 If we make a decision to close for the day with a significant amount of the day remaining, we will issue rain passes for you to come back to our Houston area family aquatic center another day. Our goal is to be fair. How do I get to Splashway? Please use our directions page. Do you provide or rent towels for the waterpark? We do not, but we do sell them in our gift shops. The average price is $12-$19. We do allow smoking in the designated smoking areas. How can I request a donation from Splashway? Splashway is happy to support our community and will carefully consider each donation request made. To submit your request, please visit our donation page to see if your case qualifies and to view instructions on how to submit. Didn’t find the answer to your questions? You can also check out the list of General Rules Guide.